Ashur-Dan is a Dunmer trader and a Brother for the Zainab Ashlanders, where he buys and sells all manner of goods, as well as offering repairs to all visitors. Ashur-Dan can be found in his yurt at the Zainab Camp in the Grazelands Region. He wears a common shirt, pants, and shoes. 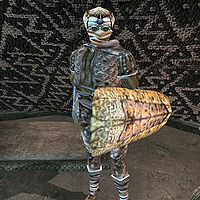 He carries a chitin club and shield, chitin throwing stars, chitin arrows, random Ashlander weapons, random chitin armor pieces, apprentice repair hammers, and up to 20 gold. Aside from his natural resistance to fire and the sanctuary provided by his ancestors, he knows no spells. "I am Ashur-Dan. I am the trader here at Zainab camp. So. You want to know the trade goods wanted among the Zainab. I can tell you what I think." "It's you again. So. You want to know the trade goods wanted among the Zainab? I can tell you what I think." "I am Ashur-Dan, the trader." "I think we Zainab need little that we cannot provide. We have always lived our own ways, and lived well. There are many fine things that might be had from the settled peopled. But what use have the Zainab for these things? I am a trader, and would be glad to make a profit. But I can think of nothing wanted that we do not already have." (Disposition at least 50) "I think we Zainab need little that we cannot provide. We have always lived our own ways, and lived well. There are many fine things that might be had from the settled peopled. But what use have the Zainab for these things? I am a trader, and would be glad to make a profit. But I can think of nothing wanted that we do not already have. But I do not know everything. Go speak with the men and women of the tribe. Ask them. Perhaps they will have ideas." (Disposition at least 50) "I can't think of anything. But go speak with the men and women of the tribe. Ask them. Perhaps they will have ideas." As a member of the Zainab Tribe, killing him will anger the tribe and prevent you from completing the Zainab Nerevarine quest, a required part of the Main Quest. This page was last modified on 14 March 2017, at 03:10.